Small wonder small wonder small wonder small wonder – it went on and on throughout the morning, the afternoon, the evening. It was the same the next morning. I had to do something to stop it. And then I had a bright idea. I was in the middle of writing lyrics for a new collection of Christmas carols. Suppose I wrote one using the words ‘small wonder’? Might that stop it? I began writing. And so the carol No Small Wonder began to emerge. And, yes, the earworm stopped. 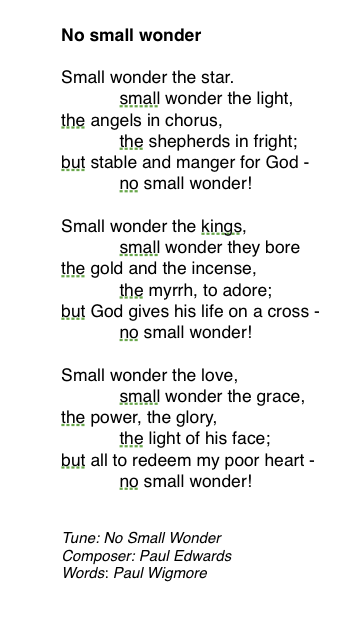 I wrote the three short verses about the wonders of the Christmas story. The crowd of singing angels! The strange star seen by the three wise men! The shepherd being told by the angels where the baby, Jesus, could be found! However, all through these three short verses there is a ‘but’. All these wonders were small wonders when you consider the astonishing fact that God himself was coming to Earth as a human being! Over all these lesser wonders came that one truly enormous wonder; no small wonder indeed. NOTE: Some internet references mistakenly refer to it by its first line, ‘Small wonder the star’. but the title remains, No Small Wonder. 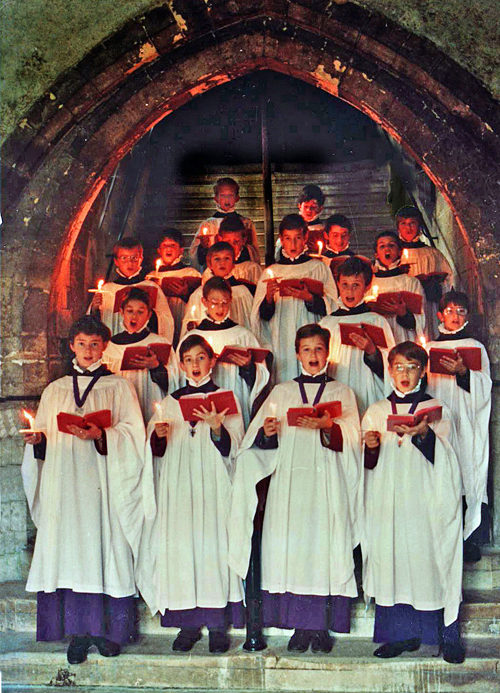 Now see and hear the recording made in Paul Edwards’s own church, with Paul himself accompanying. This entry was posted in Autobiographical, Church Music, Lyrics on 18/11/2013 by Paul.